The wall paint spraying system 985 E makes your job even easier: With the 70 cm long spray lance can be even higher ceilings and walls and large surfaces relaxed with coat color. The color is thereby drawn directly from the paint bucket, via a tube through the lance and is perfectly opaque to the wall. So spraying is even easier on the hand. Cleansing is also very comfortable - thanks to self-cleaning function, the system is in a few minutes clean. AMOUNT OF COLOR continuously adjustable from 0 to 525 ml / min. 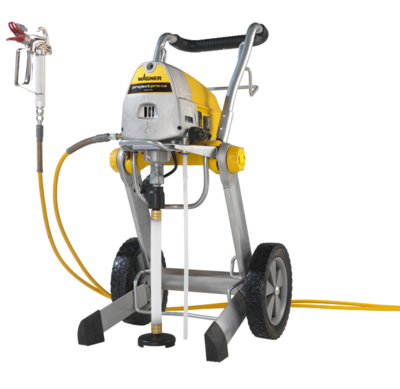 The high-performance, mobile piston pump for painting medium-sized or large objects is particularly suitable for experienced DIY-ers as well as professionals who occasionally handle spray projects. The automatic valve button guarantees trouble-free start-up and outstanding reliability during operation. The system can be used to spray all solvent-based and water-thinning lacquers and varnishes as well as emulsions and latex paints. 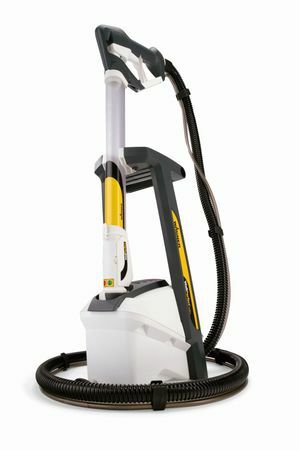 Thanks to the high-quality metal gun and practical reversible nozzle, you can clear nozzle blockages in seconds. With a length of 15 m, the high-pressure hose gives you an extremely large working radius. The folding carriage saves space during transportation and storage. Supplied with a carbide metal L 0.017 nozzle and two stainless steel L-XXL+ cartridge filters. 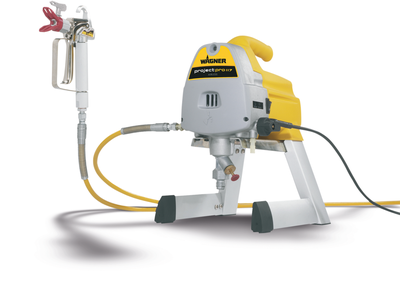 Compact, convenient piston pump with transport handle for painting small to medium-sized objects. It is particularly suitable for experienced DIY-ers as well as professionals who occasionally handle spray projects. Airless technology is used to atomise the material and produce a top-quality finish. The system can be used to spray all solvent-based and water-thinning lacquers and varnishes as well as emulsions and latex paints. Thanks to the high-quality metal gun and practical reversible nozzle, nozzle blockages can be cleared in seconds. With a length of 7.5m, the high-pressure hose gives you an extremely large working radius. The system is supplied together with an L-sized 0.017 carbide nozzle and two L-XXL+ stainless steel cartridge filters.